2017 Blessing Moon Abundance Grid! 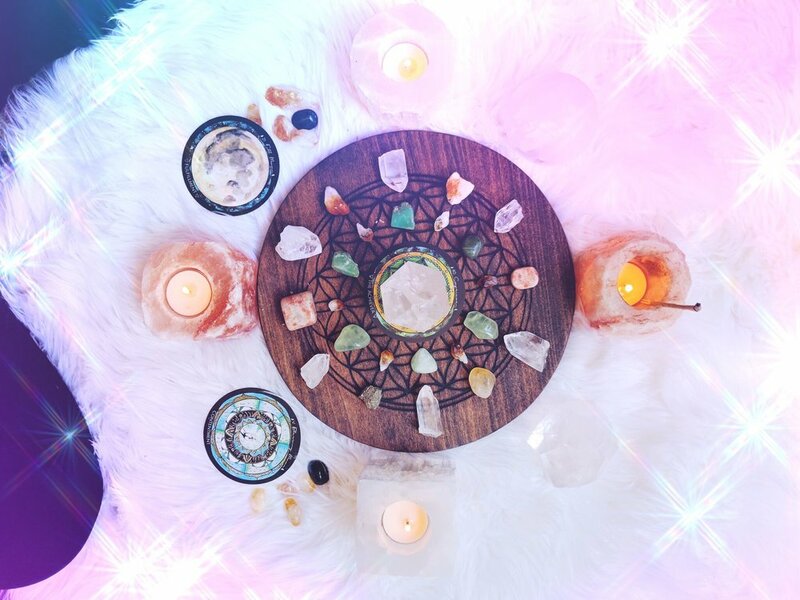 Are you ready to make a crystal grid with us? 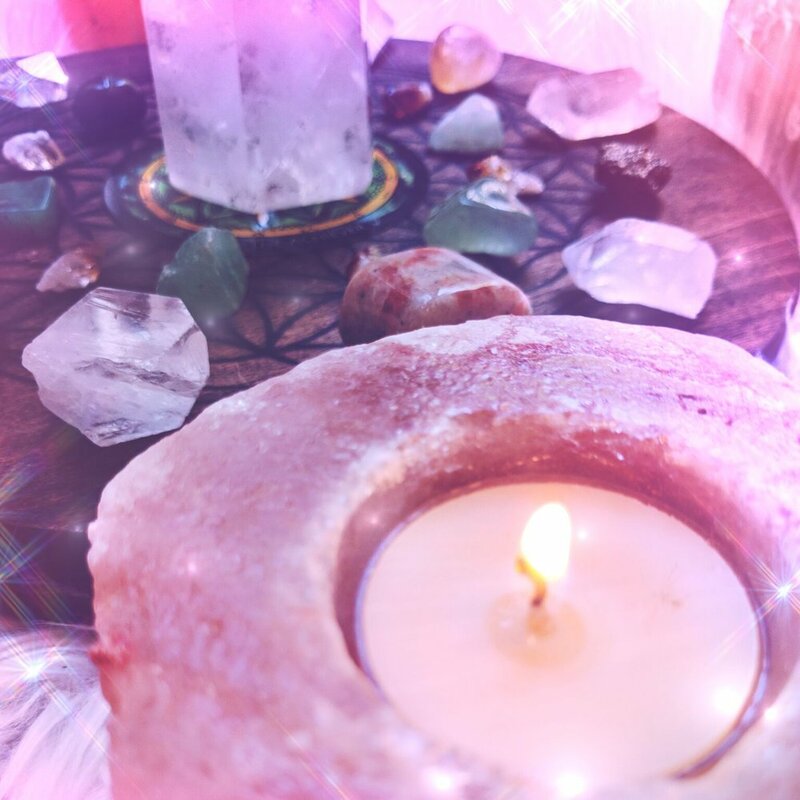 Keep reading how to create and activate your crystal grid for abundance! Putting different crystals together in geometric patterns activates the different energies of each crystal and creates a beautiful union of their vibes -a vortex of hyper-focused intention and healing. It is called sacred geometry. 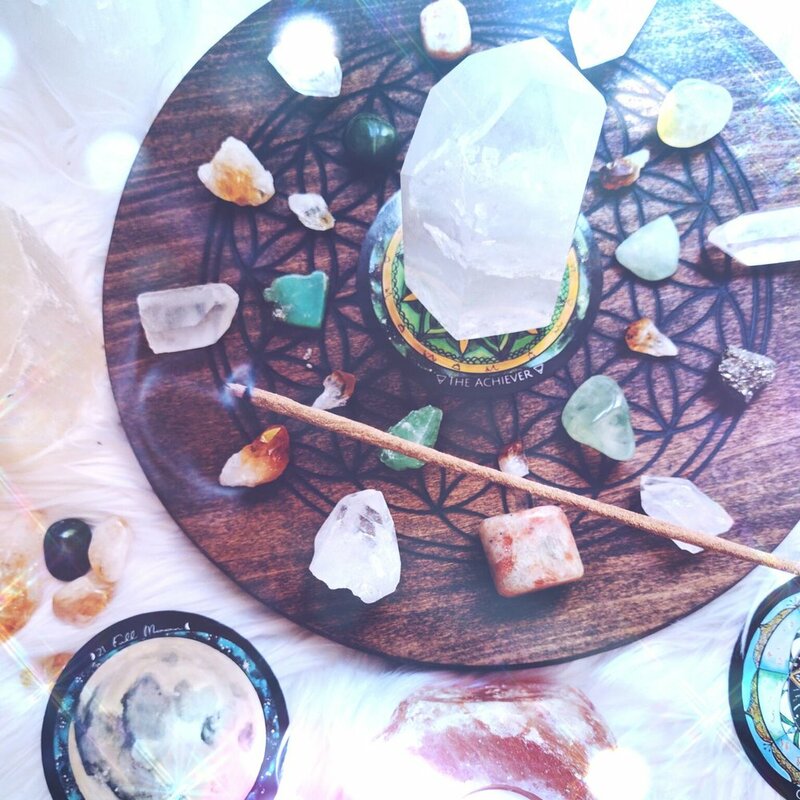 Crystal grids are beautiful, creative, and really fun to make. Sacred geometry connects us to the universal creative forces that have created all matter so we can call upon the powers of creation and manifestation! 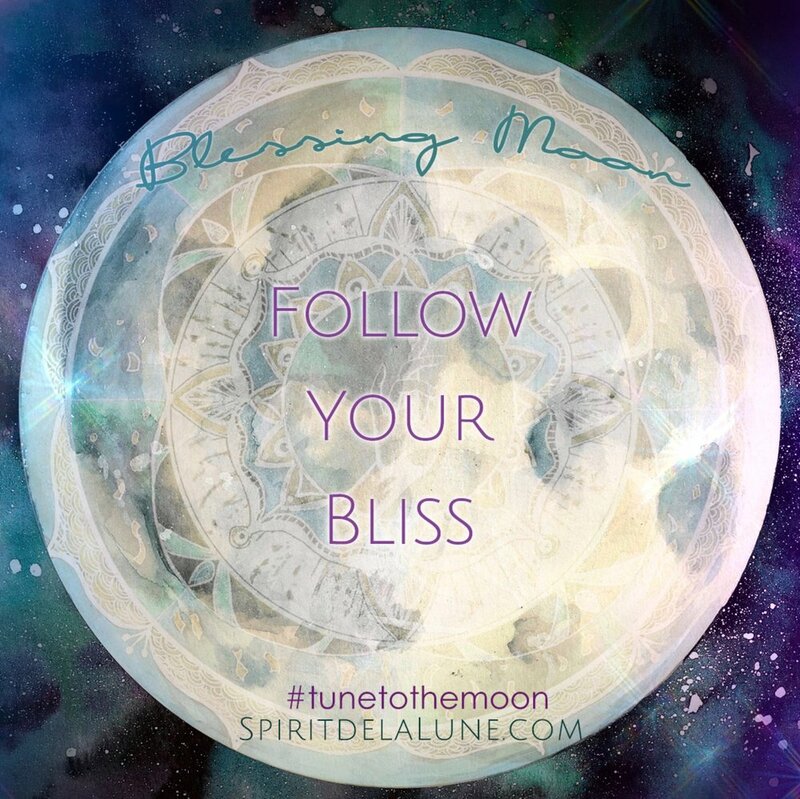 For the Blessing Moon we are focusing on our abundance that we are attracting into our lives and also the abundance that is already surrounding us! Create your own affirmation or choose one from below! Abundance permeates my whole life and I am grateful. Abundance flows steadily through my life. I receive abundance with grace and ease. I am healthy, wealthy, and abundant! Choose your crystals. There are so many crystal you can choose from! Below is a list of some crystals that help attract abundance, just remember to listen to your intuition while choosing your gems. Which crystals call to you? Have a plan. You can make your grid as large or as small as you want. Follow your intuition always. The crystals will reveal themselves to you. There is always the center stone -the core or essence of your grid that gets programmed with the surrounding crystals. This can be a cluster, generator point, a sphere, a specimen, even a tumbled stone -it typically is different than the rest, but doesn't have to be. Choose as many other stones as you want to go around your center stone. And have an idea of the design you want to make. Having multiple of the same stone will build upon their energy, or having different stones will each add their own vibrations. The choice is up to you and what you have. There is no wrong way! Have fun and get creative! The placement of the grid is important... try to place your grid on your altar or near a window for flowing energy. If you have your grid on a tray you can move it our under the Full Moon to charge! Program your crystals. 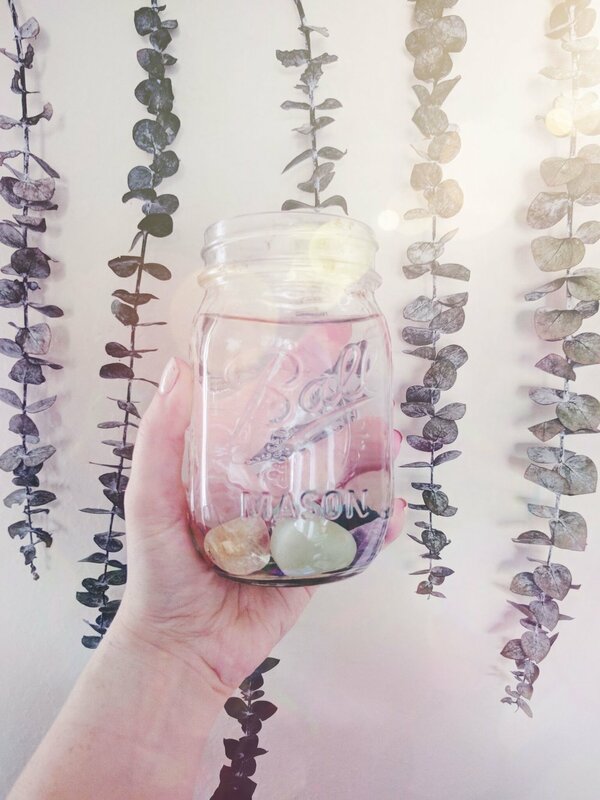 Before you lay each stone (beginning with the center and moving out clockwise to build momentum) hold each stone individually near your heart and pour your affirmation into it. Visualize it with all your senses, what you want the outcome to be. They will hold this memory. I believe all stones are programmable. They want to connect with us and help us on our journey. Each stone you have has already chosen you. Remember that! Constructing the Grid. Then set up your grid from the center out, working clockwise. You can use a grid map to place your crystals on, like The Flower of Life mandala, or Metatron's cube, but it is optional! You don't need one to have a powerful grid. Traditional grids are symmetric for even energy distribution, but as you create intuitively and work with your stones, create a design that appeals to you and your intentions. Think of it as a crystal mandala -no one will ever make this mandala ever again! 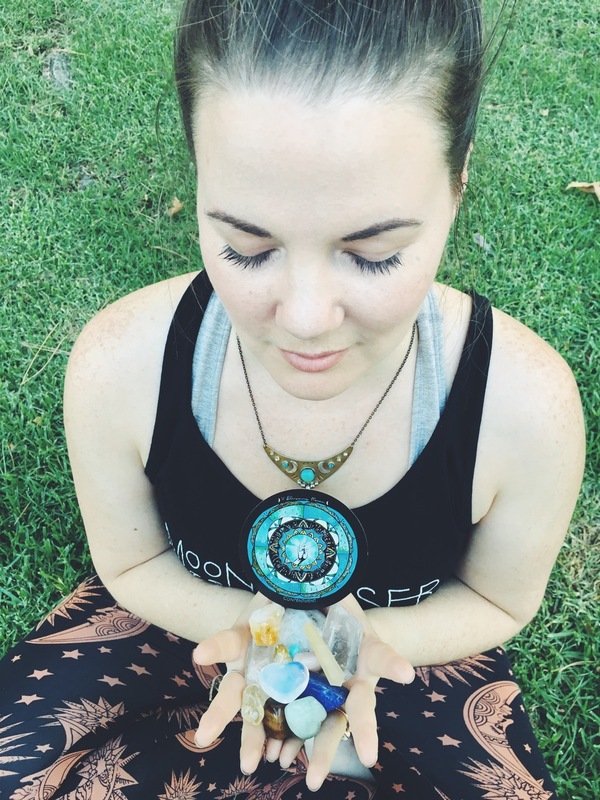 Each stone and design is different -you are activating the powerful and unique crystal healer within you and bringing your own vibe to this creation! Make sure all your crystal points are facing in toward the center stone! This is moving the energy toward the center or vortex of the crystal grid! We want to attract abundance IN to our lives! Activate your grid. 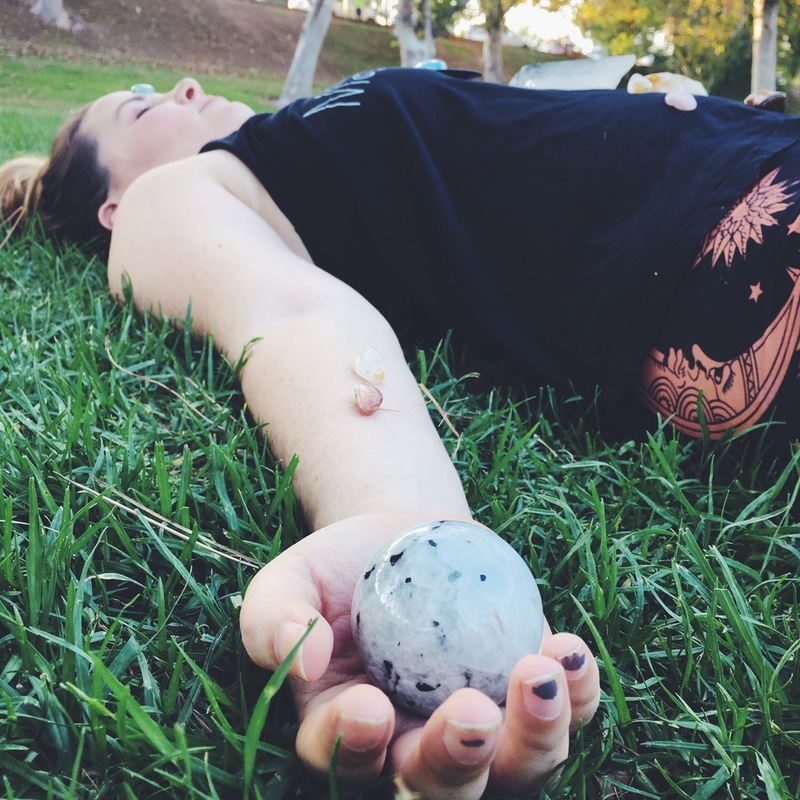 After laying each stone, take a crystal point and use it as a wand to activate the energy. If you have a traditional wand already, you can use that as well. Or simply use your dominant index finger. Begin and touch the center stone and from there touch the top crystal and touch back to the center stone; you are drawing a line of energy and connection with each stone. Think: connect-the-dots, but always bring that energy back to the center. I always work clockwise to activate. Really try to see this line of energy you are creating. What color is it? While you are doing this, say your affirmations out loud and visualize how your life will look with abundance flowing through. What are you doing? How are you feeling? Really try to embody these emotions. What people, spirit guides, animals, would you like assistance from? Do you feel the vibration and aura of the grid growing? Use the wand and visualize as long as you feel called to, but always complete the circle by ending at the top of the grid and back to center. You can go around as many times as you like or feel called to. Depending on how complex and layered your grid is, it could take a while! For good measure I always suggest going around in 3's... 3, 6, 9, or 12.... there is creative, manifesting energy in the number three and sacred trinity energy! Elemental Blessing: This is optional, but when working with abundant energy and attracting magick, I like to honor and invoke the elements.... all 4 elements are the foundation of magick and creation in the world. They are sacred allies. Invoke air: Call upon air and light incense blessing your grid and the stones you are working with...keep moving clockwise. notice how the smoke moves and shifts with the energy you are building with the grid! Cleanse yourself with the smoke as well. Invoke Fire: Call upon fire and light candles at the four corners of the grid. 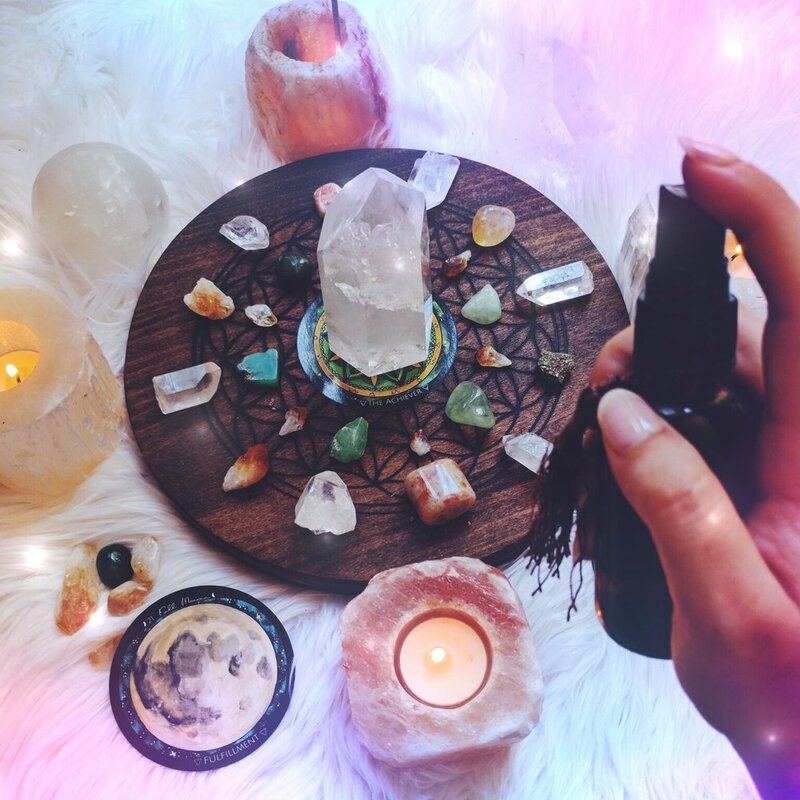 Or you can take anointing oil, and anoint each crystal starting with the center stone moving out clockwise. This is igniting and activating a deeper layer of the grid! Anoint your chakras with the oil as well. Invoke Water: Call upon water and anoint each crystal with a drop of sacred water, or moon water just like you did with the anointing oil. Or if you have a spray, spray all around your grid clockwise. Spray your aura as well, or drink some moon water. Invoke Earth: By creating this crystal grid you are calling upon earth. Simply say a heartfelt thank you to your crystal companions for their love and power. Ground your feet to the earth afterward, or eat some food for grounding. Trust and let the grid work its magick. If you can, let it charge under the Full Moon! Keep the grid up as long as you feel you need it. If animals knock it down (like pesky little kitties), it means the grid is no longer needed. You can always reactivate it and set it up again. See what unfolds and trust the grid is assisting you in the way you need it, not necessarily the way you want it. 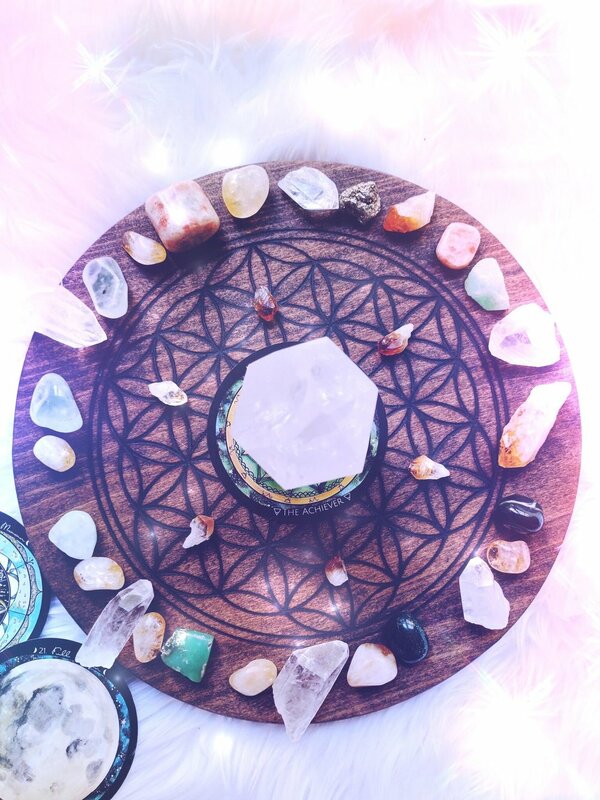 Crystal grids teach us to trust the process. Deactivate and make an offering. When you are ready to deactivate it, Thank your grid and reflect on your journey with it. Begin to take each crystal out of the grid working from the outside into the center stone. I would still keep moving clockwise to keep the abundant energy open. To complete this process, choose 1 crystal you used for your grid and offer it out to the world! Give it back to the land, or leave it somewhere someone can find. if you know someone who may need it, give it as a gift! This keeps the energy or giving and receiving abundance open and flowing and it is a beautiful gift to give! We would love to see your grids! Tag us in your pictures! 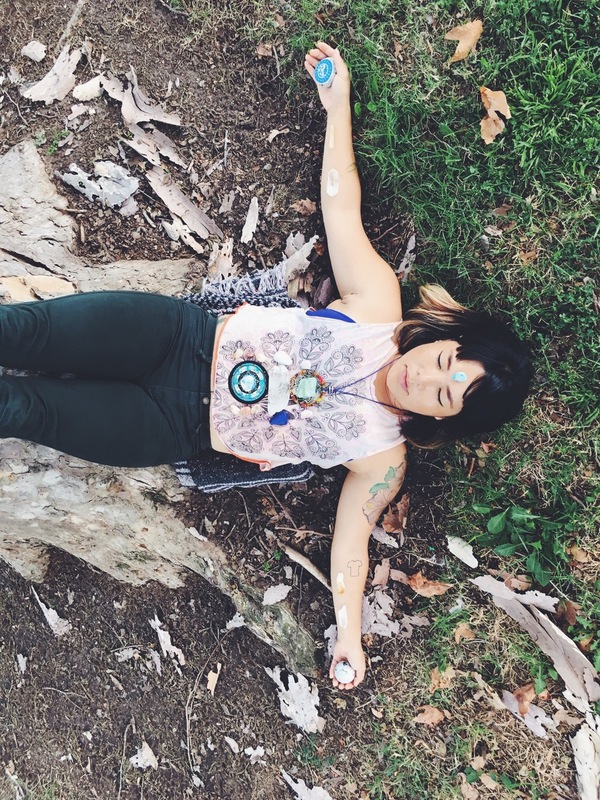 Today we bring you a movement ceremony to soften and open your heart chakra so you can cultivate contentment and receive the blessings that are already all around you. If you can, practice this asana under the Full moon's light tonight and with a Moon Sistar! My beautiful soul sistar and yoga teacher Hannah helped me with this video, my heart is full of gratitude! There is a lot of back bending and heart opening in this flow, so listen to your body and do what feels good! I find setting an intention before you begin to move on the mat brings more meditation, focus, and sacredness to your practice. Feel free to draw a card from Spirit de la Lune and explore that word while you are moving and breathing, or try the Blessing Moon spread from the guidebook! Mudras are sacred gestures that help us activate different energies in the body and prana, the life force energy, within and all around us. Here are a couple of Hand Mudras you can try during your movement ceremony or while meditating under the Full Moon . Touch the tip of your ring finger to the tip of your thumb for the Mudra of the Earth or Privthi Mudra. This gesture stimulates and grounds your Root chakra to increase stillness and contentment within your body. Let your heart soften with love and appreciation for all your body does for you. You can also adjust this mudra by pressing your ring finger into your palm with your thumb. Your ring finger should be pressing into the thumb with the tip of your ring finger resting on the mount of Venus. This is the Surya Mudra, or Mudra of the Sun and increases the fire, or agni, within you. If you need to increase your energy and vitality try this mudra with your right hand and hold a citrine crystal in your left. Chant affirmations of mantras, or take 10 deep breaths and see how you feel afterward! This is a beautiful heart opening mudra to practice and cultivate gratitude and receiving love and blessings gracefully. At heart center, bring the bottom of your palms together touching your pinkies together and your thumbs together, almost as if your are creating a bowl with your hands. Stretch out and expand your open fingers, creating the lotus blossom in bloom. Imagine beautiful moonlight cascading into this vessel and pouring into your heart. You can hold crystals in this gesture or hold a bowl of moon water and bless it with your heart and the moon before you drink it. If you do hold a bowl, drink from it while your hands are still in this gesture. Here are also a couple of variations for savasana for you to try as you end your practice. 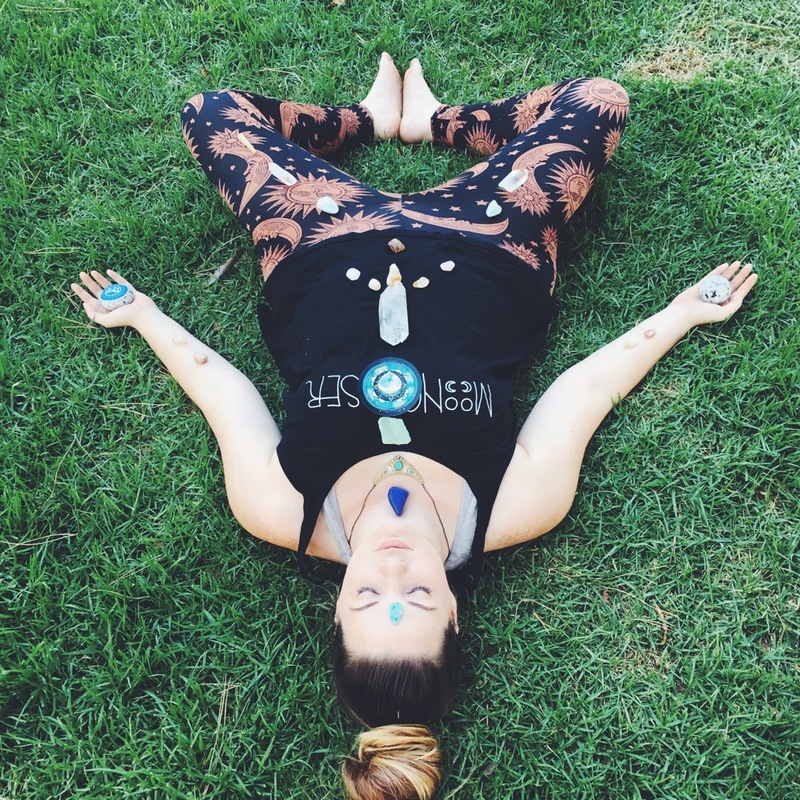 Feel free to place crystals all over your body and especially around you heart as you lay in these poses soaking in the movement you just did. Lay out under the moonlight, or imagine the beautiful Full Moon right above you restoring and healing your body with her gentle, soothing light. This is a such a rejuvenating and restoring pose for savasana. It is a gentle inversion bringing more blood and circulation to your heart. If your hamstrings are tight, feel free to bend your legs a little keeping your feet on the wall or tree. You can deepen the back bend by placing a blanket under your hips, but that is completely optional. Listen to your intuition and follow your body's rhythms. (Click the images to enlarge them). If you are outside using a tree, feel the energy of the tree commune and merge with yours. Feel the energy rising from the roots of the tree and from Mother Earth moving into you. Your body becomes an extension of that tree, as if you are another root in the tree's system. Feel the energy rising from Mother Earth into your body and send it back to the tree. You are both giving and receiving each other's love. 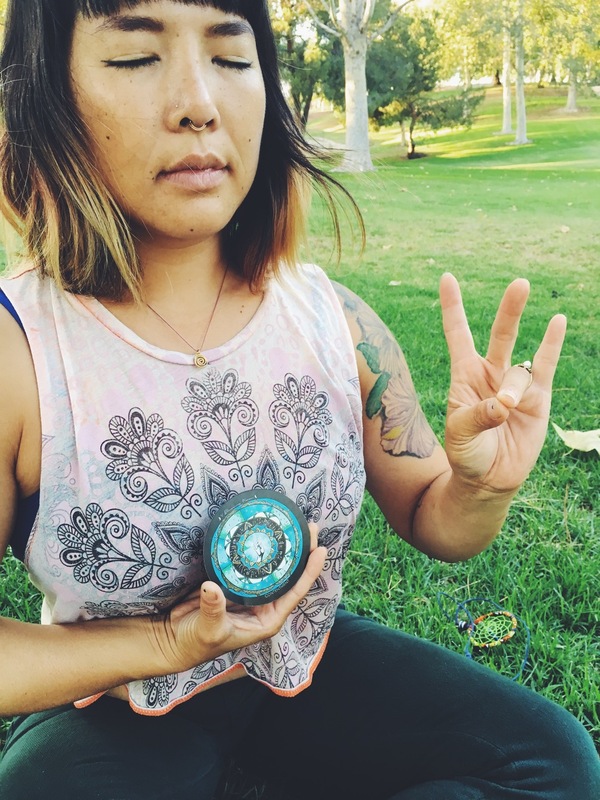 This is a beautiful grounding practice to try under the The Full Moon in earthy Capricorn! This is another restoring pose that opens the hips and calms the nervous system. You may want to put blankets under your knees for more support or even use pillows and blocks so you are reclining and not completely on the ground. Again, listen to your body and do what feels good. (Click the images to enlarge them). In this pose you can visualize your are floating in the ocean, your body supported by the gentle waves, as the Sun is setting and the Full Moon is rising. Her reflection in the water shimmers and charges the water with moondust. The moondust washes over you with each breath and each ebb and flow of the soothing, rhythmic waves. You become lighter and lighter, feeling as those you are floating to the moon, letting any tensions, doubts, or worries, sink down onto the ocean floor. You are free. You are blissful. You are content. 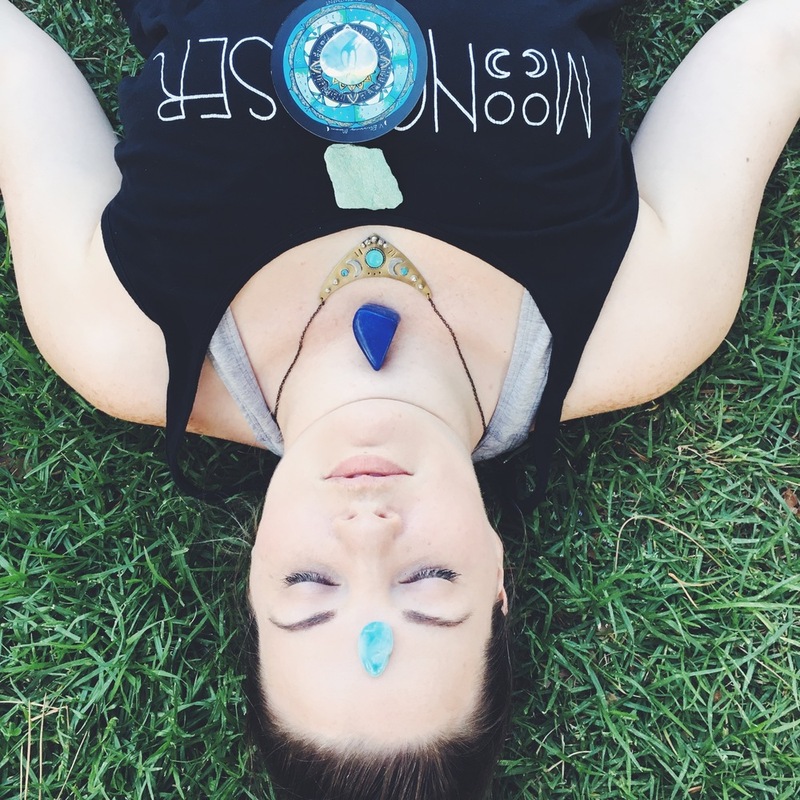 Namaste, moon Tribe. We hope you enjoy this Full Moon Asana and please let us know if you try it! 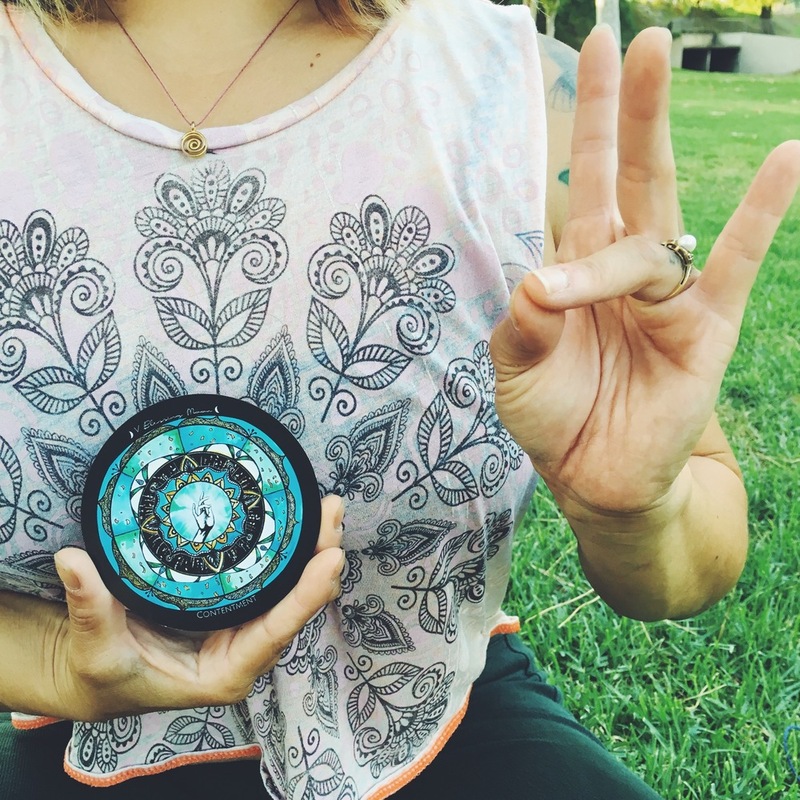 Tag us with #spiritdelalune or #tunetothemoon with your full moon readings or your favorite yoga pose from the asana! What are the blessings in your life right now?